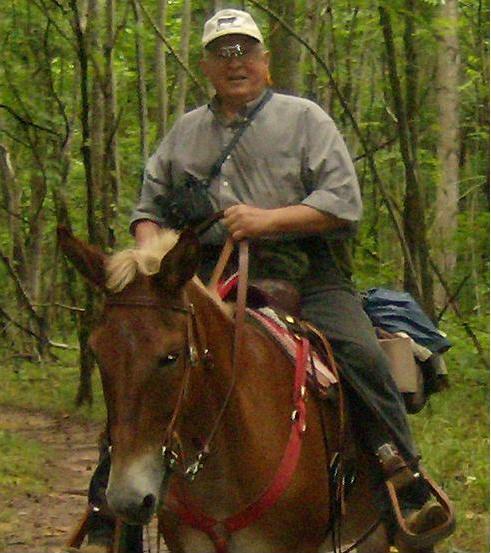 Jim Tate enjoying a Ride on Dancehall Dixie, a wonderful gaited mule owned by my good friend Stewart Wickham. As always to see any photo larger click on the photo and use your browser back button to return to the blog. I had one of the local farmers offer me a compliment the other day…he was not trying to offer me a compliment….he was trying to be diplomatic. To paraphrase his comments, he had noticed the crop diversity on my pastures. He said that he couldn’t help but notice that I had a lot of strange looking stuff growing up on my place. He had seen me out there bush hogging quite often. He offered me the use of any equipment I might need to help me manage my pastures, specifically offering a small sprayer. Now I do have some weeds….and sometimes when I go a good while between grazing paddocks the weeds go wild….I have one spot out front that is getting to have a pretty big blackberry patch….but that is because it is in the horse side and the goats cannot run with the horses because two of the horses like to chase them…but, once we finish breeding cows I will put the horses on the cow side and the goats will have the horse side for the winter and early spring. And the wet summer has kept the tractor out of two fields all year and they now have a pretty good crop of nut sedge. The goats will deal with that over time…. 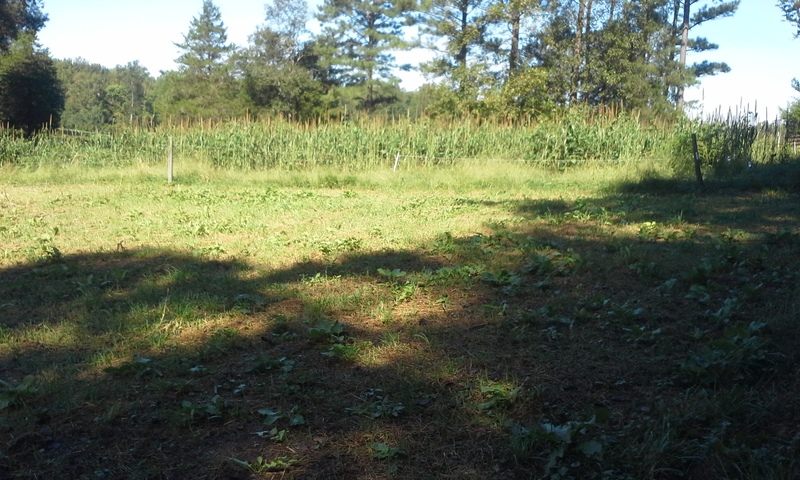 I have totally different weeds on the two different sides and a more frequent rotation would be my best cure. The milkweed from the cut over land next door last year pretty well inoculated my fields for this year so I have some of that as well. But I don’t let a few weeds drive me crazy. Mother Nature does not typically grow things in a monoculture…only humans do that and we convince ourselves that is the way it has to be done. I thanked him for the offer and said I would keep it in mind. But I told him that we have a half dozen weanling calves gaining about a pound and a half per day on the weeds. We will graze the three horses and two miniature donkeys for about 10 months of the year before starting to feed some hay. Every summer and until mid December I normally have a half dozen heifers to develop for breeding. 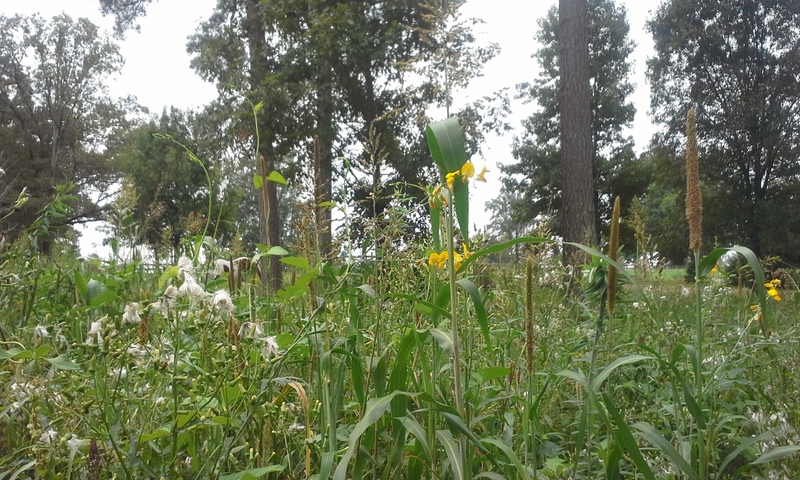 The current crop just entered the grazing below and I have not seen them since….that stuff is six to eight feet tall. They will come out in the evening for their evening handout and roll call. Don’t need to feed them much with forage like that but a little handout keeps em gentle and they come to call. We have some rabbits that I see most mornings in the dark as I am on my way out to go to work. Have seen as many as six at one time….The weeds is the only way they survive the numerous hawks and owls and the occasional eagle. The greatest benefit of all is that on 12 acres I now think I have three coveys of quail this year…I can not yet swear that I have three coveys but I know I have two and think I have a third that is in pretty close proximity to the second covey. All summer I have been reminded of my late friend Jack Ellis who was an avid bird hunter and had some good English Setters. He hunted birds from November thru February culminating in a couple of weeks at a hunt club in South Carolina in February. But while he did all the things DGIF suggested he never had any quail on his farm and had to go elsewhere to hunt and seldom found any birds. I am reminded of him because every day I hear the quail calling from right around me as I am walking about and doing work around the farm, and more often than not if I am in the fields a dozen birds will explode from nearby testing my heart….Went to the doctor for a checkup this morning and he said I needed an EKG as it had been over a year and a half since I had one….I said no…I had a heart test Friday and again Sunday…I Had to work our District booth at the Fair Saturday so I skipped the heart test that day. Fridays test was right at the upper right hand corner of the photo above. About fifteen birds straight up and zipped into the wood line. A couple of years ago a turkey hen nested within 200 feet of my front door in my weeds…I found out about it when one of my dogs stumbled across the nest and brought me a dead poult. If it were not for the tall grass and weeds, I would not enjoy any of this. 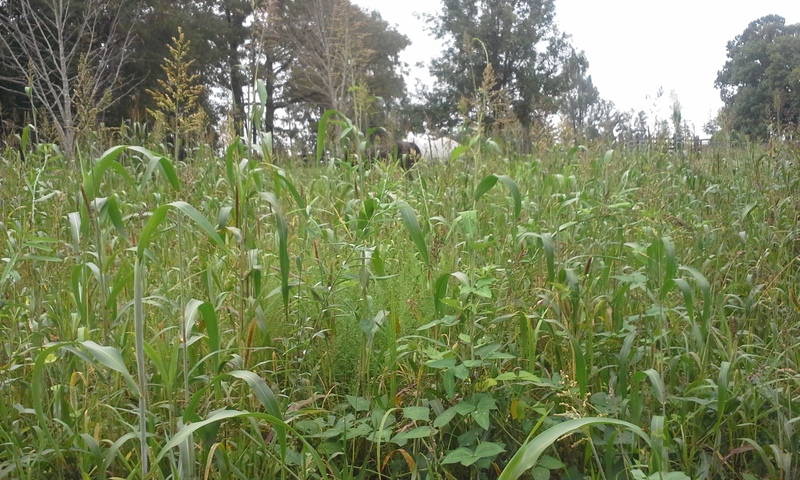 I broadcast some type of seasonally appropriate cover crop on every paddock after most every grazing and bushog it. I move the stock normally about every three days. I give them small paddocks and when they have grazed it shut them out to let the paddock recover for at least 60 days. Of course all of my weeds are not weeds. I think the neighbor was worried about Johnson grass. But what he was seeing was Sorghum Sudan grass. I do have some Johnson grass on the back of the place but the cattle love it and it only persists because I intensively rotate my grazing. My biggest chore is in keeping the fences clear of tree seedlings. I prefer not to spray herbicide and try to mow under the fences…but mowing well grown grass is hard on mowers and I have spent a lot of money on mower repair this year….I tried a wheeled string trimmer and it did not work for me…the horses will not graze near the electric fence, so it is a bigger problem on the horse side…. Again my best solution will be to find an easier way to rotate ruminants and non ruminants….part of the obstacle is the wife has definite opinions on what animals consider what buildings and paddocks as “home”. And when I have calves at the house I need to access the working facilities with them for monthly weighing and such. Another option would be to sell the horses that chase the cows and goats but they are my favorites….and a stock horse is supposed to like to chase stock.